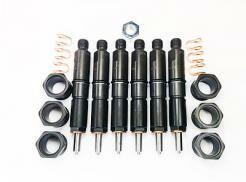 * OFV060HP Use with super street performance Cummins trucks. * Fuel pressure range of 43 to 50 PSI. * Raises fuel pressure at full power. Do you experience low fuel pressure at wide open throttle (WOT) and just accept it as normal? Have you ever thought that low fuel pressure gives your competitor an edge? Anthony Reames, the technical manager at Air Dog, asked us to solve the low fuel pressure problem with the Bosch P pump. Cummins owners report that the fuel pressure drops to as low as 16 PSI during full throttle runs. We jumped on this technical request because we thrive on a challenge. Solving problems is what Tork Teknology is all about. The first thing we did is throw all assumptions out the window. We found that in most cases, they can be very misleading. Our slogan, that we live by, is "one good test is equal to a thousand expert opinions". This is how we attack a problem. After installing an Air Dog II DF165 on our '98 Dodge Cummins test truck, we routed the 1/2" feed line to an accurate flow meter and ran all the return fuel through an additional flow meter. The fuel pressure was monitored by a glycerine filled pressure gauge. The results (shown left) align exactly with proven hydraulic formulas. Fluid will flow a specific volume through an orifice at a specified pressure and specific gravity. Simply put, a fluid will flow more volume (gpm) as the pressure increases through the same size orifice. Put another way, reduce the orifice diameter, and the GPM flow will drop. You may have asked yourself why Air Dog and FASS equipped Dodge Cummins trucks will show good fuel pressure at idle and cruise, but the pressure drops at full throttle, to as low as 16 PSI. Take a look at the photo above. 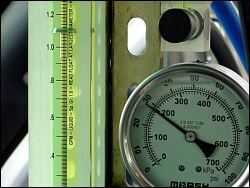 The flow meter indicates diesel fuel flow of 1.09 GPM. This is the volume of fuel flowing thru the inlet orifice at the base of the overflow valve. (see photo right) Actually, it translates into 1.14 GPM (multiply number by 1.0495 correction factor) flowing into and out of the P7100 pump. That is the volume of fuel flowing back to the tank through the Cummins overflow valve. Yes, we tested both the Bosch and Tork Tek overflow valves. 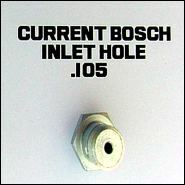 If you are using one of the old Bosch valves with the .168 inlet orifice, your fuel pressure will never allow you to win ANY competition event becuase of very low fuel pressure. I'm not saying that the Air Dog and FASS are not good pumps. Both are quality pumps. The problem is the orifice leakage is too large and bypasses too much fuel to tank. This leakage produces low fuel pressure at WOT. We now know that the inlet orifice on a standard Bosch overflow valve will flow 1.14 GPM back to tank. This is how it lowers your fuel pressure and kills your Cummins diesel performance! If you run an AirDog 100 GPH (gallons per hour) pump, you are pumping 1.66 GPM. (100 GPH divided by 60 minutes/hour = 1.66 GPM) You are losing 69% of your pump volume thru the overflow valve. That's almost 75% of the fuel doing no work at all! Let's do the numbers for the Air Dog II DF165 which is rated at 2.75 GPM. If you lose 1.14 GPM to tank, 41% of your pumps capacity is LOST. Let's suppose you use the AirDog II DF200 which flows 3.33 GPM. 34% of the pumps capacity is doing nothing for your performance 12V Cummins. It's easy to see why performance P pump users are showing low fuel pressure at WOT. Too much diesel fuel is pumped through the Bosch overflow valve and back to tank. This translates into lower HP and torque performance numbers with your Cummins 12V. It could make the difference between winning or going home defeated. Another problem that we uncovered was at a very specific pressure, the fuel flow through the overflow valve can be dead headed. This can be dangerous as the P pump needs fuel flow to help keep it cool. If you set the AirDog pressure regulator to slightly less than the OFV setting, fuel flow and pump cooling STOP. Also if you adjust the OFV by adjusting the shims, stretching the spring or adjust the Tork Tek overflow valve, the same problem can exist. 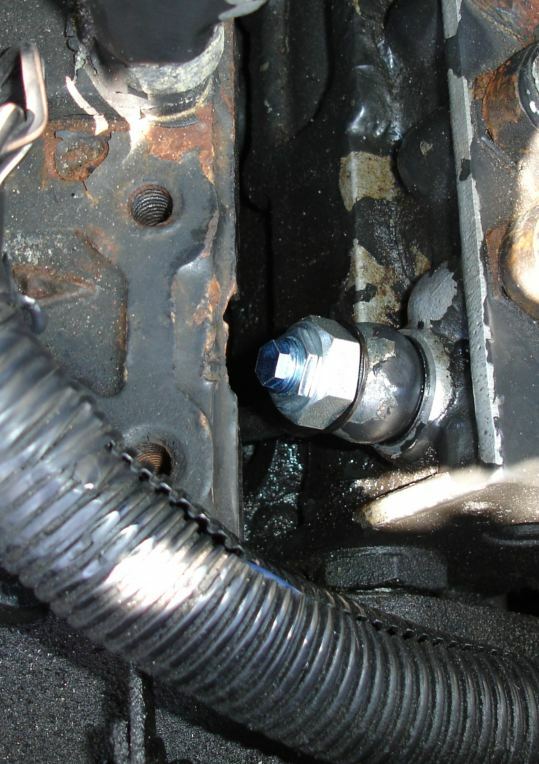 The solution had to cure low fuel pressure and eliminate any possibility of stopping fuel flow thru the valve. WHAT ABOUT INJECTION PUMP COOLING? We know from testing the Cummins 5.9 fuel system, with the stock lift pump, that fuel flow is .59 GPM (max) at 2200 RPM. The engineers at Bosch spent a lot of R & D time to make sure the P pump stayed cool at the fuel flow the lift pump delivered. The Bosch P7100 injection pump will run without problems for 300 to 500,000 miles or more! There are commercial trucks that have seen 1,000,000 miles with the P pump and the Cummins lift pump. The smallest of the four valves is the OFV070HP. This valve is for super modified, race only trucks. The 070HP orifice will flow .565 GPM at 45 PSI. So, even with the smallest of the valves, you will still be within 4% of the cooling capacity of a stock system. How did we test for a solution? 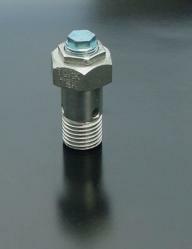 We machined 12 prototype overflow valves with replaceable orifices, similar to Holley carb jets. The beta testers could now replace the jet with a smaller one to the point where the fuel pressure was aceptable at WOT. In other words, the fuel pressure remained constant from idle to full throttle. Each jet change and fuel pressure reading was documented on a chart. In addition, I made the same tests on our '98 Dodge Cummins 12V. It became clear after the testing was complete, which sizes cured the problem. Each size created a fuel pressure range at WOT. We also discovered that a very small change in orifice size will make a dramatic change in fuel pressure and fuel flow. We tested the valve and it flows less than .28 gallons per minute. Because the orifice is so small, I DO NOT reccomend this valve for street use. I'm concerned about adequate cooling, for the P pump. I suggest that you use the OFV060HP on the street and switch to the OFV075 at the track. What fuel pressure should you be running? Here is a general rule to determine the fuel pressure you should be at. Multiply the governor spring rpm (in thousands) times 10. In other words, you want 10 PSI of fuel pressure per 1000 RPM of govenor speed. If you installed a 3K govenor kit, you need a minimum of 30 PSI at full power. A 4K kit requires 40 PSI at WOT. 5K requires at least 50 PSI. Remember, this is at full power, not idle or cruise. Here's the advantage to the competition Cummins owner. With that little of fuel being returned back to tank, you can achieve maximum fuel pressure at full power. If you are experiencing low fuel pressure on your competition Cummins, give the OFV075HP a try ! ALL THE PROBLEMS WITH THE BOSCH OVERFLOW VALVE HAVE BEEN SOLVED! Talk to any owner of a Cummins P pump, and he will tell you he has replaced his P7100 overflow valve. Several of the HP guys are on their second and third return valve. WHY? The number one complaint that I hear is "My Cummins 5.9 diesel is losing power and it's difficult to start". With that information, we cut many over flow valves in half to find out why. We were shocked by what we saw! Through 14 months of testing on a flow bench and on our test truck, we know exactly why the Cummins return valve is not a good design. The Bosch spring has a history of breaking and it loses its spring force. This dramatically reduces the fuel pressure in your injection pump. This causes low power and your Cummins will be difficult to start. To cure this problem, we use premium, custom made springs in our overflow valves. The leading spring maker in the U.S. has worked with us to produce a superior spring. The spring manufacturer tested the service life at 1,000,000 cycles to the second power. Basically, infinite life! Our new design seat and ball puts less fatigue on the spring, as well. The Bosch overflow valve will idle at 15 to 18 PSI. Our valve will show 25 to 26 PSI at idle. The shifter on our test truck vibrates much less and the engine idles 30 RPM faster with the Tork Tek valve. Your engine will run with less vibration and experience an off-idle power increase (great for towing). Customers email every week and say that starting is much easier! The best return valve they have ever used on their Cummins. The OFV010 is for stock fuel systems that run on diesel fuel. Do not use this valve with WVO or biodiesel. These fuels will erode the ball and wreck the seal. If you have a stock fuel system and run alternate fuels, order the OFV020. 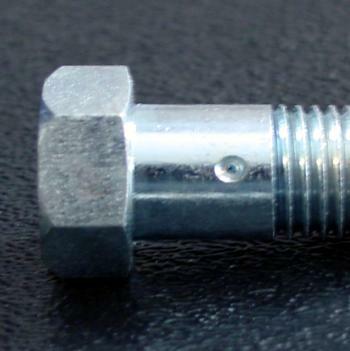 The OFV020 is built with stainless components and a Viton seal. Included with the overflow valve are banjo seal washers and detailed instructions. Installation is easy and takes only a few minutes.